A pioneering platform of book readers and authors to explore and experience the joys of the literary world through meaningful encounters. 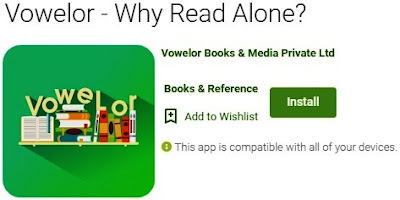 Vowelor Books and Media, a progressive technology start-up has launched Vowelor app – India’s first platform for book lovers. This platform is the result of keen observation of issues faced by the readers and writers in the current literature landscape especially in India. With the concept of “Why Read Alone”, Vowelor aims to give readers and writers an inclusive platform that not only lets them to connect with like-minded book lovers but also solves their problems such as finding good books to read and discussing about books they’re currently reading in real-time. Virtual micro-communitiesof book readers and writers referred as Book clubs on the app cater as a forum for discussions and sharing reading and writing experiences. It’s an excellent medium that authors can leverage to discern the readers' expectations. Vowelor is an invaluable association of eager minds to explore and build fine literature. The app facilitates creation of personal and dynamic library to which users can add books that they are reading or wish to read and even update their reading status. The book clubs on this authentic platform enable readers to explore more books thus stimulate the desire to read more. The platform’s powerful recommendation engine's personalized suggestions ensure an involved and stirring reading experience for the members. The platform also connects authors and readers. Authors can feel the pulse of the readers and determine the popularity of their books. Vowelor focuses on providing an interactive bookishcommunity experience while its foreign competitor Goodreads is inclined towards book reviews. The app will soon support book promotion services for authors and partner with publishers. This promotion service will leverage Vowelor's Author Program which strategically promotes authors and their work. Prominent authors such as Nina Lekhi, Anita Krishan and Rishabh Puri have been associated with this program in the past. As the membership grows the iOS version of the app will soon be launched.